ABSTRACT: A review of Allen Forte’s recent study of the atonal works of Anton Webern (opp. 3–16). 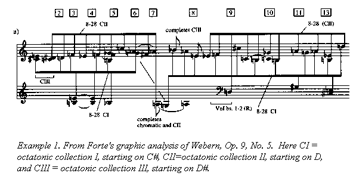 Forte contends that this music is best understood using the concept of octatonic cycles, but treats issues such as Webern’s approach to the texts he sets, his use of autobiographic pitch mottoes, and rhythmic proportion schemes derived from the composer’s familiarity with the music of the Renaissance as well. [2.1] Forte’s work has been guided by a cartographic impulse that can conceal the deeper value of his innovations. In the present work, for instance, he tirelessly maps out the surface of several dozen individual movements by Webern, in many cases relating each and every note to a matrix consisting of octatonic subsets grouped together according to which of the three forms of p.c. set class 8-28 they evoke. As often is the case with Forte, the actual analytical insights are often concealed below the surface of the analyses. Insights are here in abundance, however, especially in Forte’s treatment of the later works of Webern’s atonal oeuvre, opp. 12–16. Paradoxically, it is in discussing these works that Forte makes his case for the centrality of the octatonic to Webern’s music most convincingly, even though (as Forte himself admits) his octatonic Swiss army knife works less infallibly here than in the earlier opus numbers due to Webern’s introduction of an increasing number of non-octatonic surface formations. His treatments of opera 5 through 11, which are the most familiar analyst fodder in the book, are unlikely to please most scholars with an emotional and vocational stake in Webern analysis, since Forte’s octatonic re-mapping of these well-known pieces tend to ignore virtually everyone’s favorite notes, favorite lines, and favorite segmentations in the service of octatonic clarity. Perhaps this is not such a bad thing. [2.2] Forte’s thesis is that octatonicism governs much of Webern’s atonal music. Other salient collections, e.g. the composer’s favorite 4-7 tetrachord, tend to appear “at junctions of distinct forms of the octatonic and through interpolations.” Forte makes it clear that by octatonicism he means octatonic cycles, i.e. deployments of significant segments of each of the three distinct forms of the octatonic, labeled according to van den Toorn’s practice as CI, CII, and CIII. Formations that do not themselves form subsets of the octatonic collection are often explainable as the conjunction of octatonic subsets from two of the three discrete forms of the octatonic collection; Forte’s insistence on the hegemony of the octatonic is most vexing when such formations already seem to be perfectly straight-ahead instantiations of chromaticism or salient p.c. set classes which are not part of the octatonic system. This text is, if nothing else, a valuable experiment in putting one’s favorite readings of Webern on hold and approaching the music with fresh, albeit often counterintuitively tuned, ears. (7) A few examples from the book’s many detailed analyses will illustrate what is provocative and what is problematic about Forte’s octatonic thesis, which is advanced as skillfully and readably as could be wished. [3.1] Example 1 is reproduced from Forte’s analysis of Webern’s Six Bagatelles Op. 9 No. 5. A conventional, chromatically-oriented analysis of the first seven measures of this movement hears the semitonally ascending line e1 (measure 1) - f1 (measure 3) - g 1 (measure 4) - g1 (measure 6) as a kind of guiding progression along with a complementary descending line starting on the viola’s c1 in measure 1, moving by semitone to the first violin’s a in measure 7, forming a “wedge” formation of the sort familiar from certain pieces by Bartok and Berg. Complications result in measure 6 from the exact coincidence of the viola’s a 1 with the cello’s g1, which obscures the orderly ascent of the upper line (the a 1 ought to occur at some point after the g1 has sounded), and from the delayed arrival of the first violin’s a, which, if the first-species rhythm of measures 1–4 were maintained, would arrive at the same moment as the viola’s a 1 in measure 6, rather than a full measure later. Disambiguation of these complications occur in the second half of the piece (measures 8–13), which thus becomes an atonal analogue to continuous binary form, especially since the “wedge” of measures 1–7 starts over in measure 8, this time from the single axis pitch e1 rather from the dual c1 - e1 axis of measure 1. The problematic a 1 of measure 6 and the a that would conclude the lower of the two “wedge” lines in measures 1–7 finally appear in measures 11 and 12, thus tying the two halves of the movement together and providing a type of formal closure that is easily conveyed in both analysis and performance. Closure is further ensured by the i.c. 1 Stimmentausch involving the pitch classes D and C that undergirds the last five measures of the piece; C is the first note of the movement’s first moving melodic line in measure 1, and D is the next note in the “wedge” formation begun in measure 8, octave displaced for emphasis (an unsounded d1 is the point of origin of both upper and lower “wedge” lines in measures 1–7, furthermore). 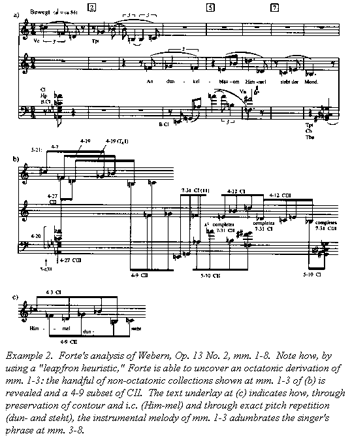 [3.2] Although Forte surely is aware of readings like the foregoing, he maintains, “Here as elsewhere in Webern’s octatonic atonal music, chromaticism results from the interaction of octatonic threads” (italics his). (8) He notices the D - C voice exchange (in his Ex. 8.11d), but doesn’t label it as such, and in order to extract 8-28 CII (the transposition of the octatonic collection starting on i.c. 2, i.e. D) from the top “wedge” line of measures 1–7, Forte must demote the chromatic lines to the status of incidental artifacts; the passage is really about the confluence of 8-28 CI, CII and CIII. [3.3] One problem here is the embarrassment of riches. If Forte heard Webern’s music as a series of harmonic regions, each dominated by a single octatonic collection or subset thereof, there would be more of what he terms “analytically dissonant” notes, and in places his octatonic argument wouldn’t work at all, but when it did, the results would be aurally and analytically striking. Instead, Forte’s more inclusive understanding of octatonicism explains almost every passage reasonably well, but almost sets aside the issue of audibility; the fact that each of the three octatonic collections is equidistant from the other two, each sharing half its membership (four p.c.s) with either of the other two, makes it hard to hear the completion of an octatonic set per se as a salient event. Further, with all three octatonic collections in play at all times, the issue of falsifiability rears its head; can one imagine any complex chromatic music that isn’t, in Forte’s terms, octatonic? The world eagerly awaits the next volume in the Yale series. [3.4] I am of two minds about most of his analyses. We can extract from his graphic for Op. 9 No. 5, for instance, benefits which I list below, most of which are not obtainable from chromatically-oriented readings such as the one given above. I can imagine counter-arguments to most of these; in the final analysis, one’s preference for either linear or chordal ways of hearing (for what I term either a voice-leading or a p.c.-accumulation model) will determine one’s analytic preference. [3.5] (1) In measures 1–2 Forte’s graphic suggests an appealing sense of CIII gradually shading into CII (of two intersecting but distinct harmonic planes, in other words), and a corresponding, albeit more lapidary shading of CI and CIII back into CII in measures 7–9. CIII maintains a shadowy presence throughout the piece, which has implications for the ending (see below). [3.6] Counterargument: As mentioned above, hearing boundaries between octatonic collections is quite difficult; here, furthermore, to hear measure 1 as Forte does we need to ignore the composer’s presentation of the 4-3 the tetrachord as the major third C - E plus the whole step C - D and parse it as C - E plus C - D (the lowest note of the viola’s melodic figure and the highest note of the lower strings’ accompanimental dyad, and vice versa). [3.7] (2) Forte suggests a raison d’être for the odd c2 of measure 5. If one excludes the argument that this is a relatively “fresh pitch” (and perhaps this is one place where such an argument might be tolerated), it is easier to say why Webern doesn’t place certain pitch classes here than it is to explain why he selects this pitch class, in this register, here. Forte’s analysis allows us to hear this as a law-abiding member of 8-28 CII. [3.8] Counterargument: But why this pitch class in this register? If we hear this note as not belonging here, we can hear it as a rather plaintive forerunner of the c 2 - d2 (cello, measure 9 and viola, measure 13) progression that unfolds as a result of the voice exchange of measures 9–13, about which more below. [3.9] (3) Forte provides an explanation of the whole step a - g in measure 7. Major seconds are perhaps the most problematic event to process in Webern; they retain a small residuum of the connective power of the semitone, but represent a different degree and type of connectivity, a far more conditional type of cohesion. This major second is the hinge between two octatonic collections, as well as the place where the aggregate completes itself for the first time in the piece. (Virtually all imaginable readings agree that measure 7 is a special point of articulation in the movement; had Webern added a tempo inflection to this Bagatelle, as he does at least once to each of the five others, this would have been the place for a ritardando.) This is one of the few places where even the multifarious connective possibilities made available by Forte’s octatonic threads indicate a break: CII, which dominates measures 1–7, has no g, which thus signals a change of collection. Note that in retrospect this makes the a - g whole step of measure 7 an example of the same disjunctive behavior as the c 1- d 1 whole step of measure 1, whose d 1 is part of CII and whose c 1 isn’t. [3.10] Counterargument: Even though this may seem the most convoluted explanation of the lot, I rather like it; perhaps analytical derivations of most major seconds in Webern should be analytically complex, just as analytical derivations of the “Tristan” chord as it functions in tonal music inevitably require several steps and point in several different directions. [3.11] (4) Forte gives an account of the final chord of the piece in measure 13. Because things that sound like chords in Webern are seldom neat statements of octatonic subsets, Forte usually has to resort to hearing them as the conjunction of subsets from two different octatonic collections. Here three of the four simultaneous pitches on the second eighth note of measure 13 are members of 8-28 CI, and two of them are members of CII; the viola’s final d2 is common to both sets. If we hear CIII, presented in a more fragmentary fashion than the other two forms of the octatonic, as a destabilizing element, this final measure suggests its final exclusion — and a complicity of CI and CII. [3.12] Counterargument: Except, as mentioned above, for the voice-leading connections with the c2 in measure 5 and the special status of the pitch class D in the movement as a whole, this is as good a derivation of measure 13 as any. This measure pulls together disparate monads from several places in the movement, e.g. the b from measures 3–4 and the e 1 from measure 8, and the cello’s e is “analytically dissonant” in almost every case. [4.2] The problem raised by Forte’s casual use of the formal schemata of other writers is this: what is it that determines which classes of detail ultimately constitute a work’s inner form? This question is more readily answered with respect to the tonal repertoire, where a committed, acculturated listener can readily move from outer form (melodies, motives, sections) to inner form (Stufen, the Ursatz); when it comes to the atonal repertoire, however, the progression from outer to inner form is no progression at all, since outer form may be murky even to the best listeners, and inner form may be perceptible if at all only through a process of analysis which is largely divorced from the act of real-time listening. [4.3] It is when Webern’s outer form is murkiest that Forte is at his best. Take, for example, his analysis of the second of the Op. 7 pieces for violin and piano, a supercharged, supersaturated sonic landscape where few others would dare to tread, an envelope-pushing part of Webern’s repertoire that is nearly as hard to hear as it is to perform. This analysis, perhaps the longest in the book, is admirable because here the undeniable octatonic component of the music provides a filter with which to process the music’s overwhelming surface complexity. [5.1] Op. 12 and the works that follow it provide the boundary conditions of Forte’s octatonic theory, which ceases to explain the surface of the music even to the somewhat equivocal extent it does in opp. 3–11. Part of Forte’s Ex. 12.3, an analysis of the beginning of the song “Die Einsame,” the second of the Four Songs Op. 13, is reproduced as Example 2. [5.2] While the score itself suggests that stepwise motion and common-tone relationships are by no means irrelevant to this phase of Webern’s music, Forte’s Ex. 12.3(b) is a persuasive example of the analytic power of Forte’s approach, and shows some of the unexpected conclusions to be drawn from his octatonic reading. On the one hand, one wants an analysis to take into consideration the gravitational attraction of small intervals and the predisposition of one’s tonally acculturated ears to find linear relationships in the thicket of notes presented to it by Webern. Virtually every pitch in the excerpt has a semitonally adjacent voice leading consequent, taking stock of which provides a strong sense of Webernian melodic fluency: high points connect up with high points, lows with lows, and the singer’s melody in measures 3 ff. turns out to be cleverly adumbrated by the cello and trumpet figures in measures 1–3. Indeed, the dyad F - G has quite a history in this excerpt: at first it is presented in that order across the cello-trumpet timbral divide, then it forms the head motive of the singer’s line in the palindromic ordering F - G - F. After the bass clarinet’s thrusting ascent to A, which connects with the clarinet’s A in measure 1 to create a retrograded transposition of the motive, the cello enters with an F / G trill, expanding the i.c. 1 dyad to a whole step (about which interval see above). Meanwhile, other i.c. 1 dyads are forming parentheses of various sizes in various registers, e.g. the C - D between the cello’s first note in measure 1 and the voice’s highest note (measure 6). And on and on, until there are so many different connections between so many different pitches that the results make Forte’s most “prismatic” octatonic analysis look like Form 1040-EZ by comparison. [5.4] After going through Forte’s many detailed analyses, one suspects that his octatonic argument works best when applied to the totality of atonal Webern, rather than as a satisfying way to attempt to hear any single piece. If this is true, Forte’s agenda is somewhat more radical than one might think. According to conventional wisdom, one of the defining characteristics of the modernist aesthetic is contextuality, i.e. the need to create and experience every composition as a law unto itself. Forte, by presenting Webern’s atonal works as a number of different composings-out of a relatively handful of basic octatonic cycle “backgrounds,” is making a strong relationist claim for this hitherto safely contextual repertoire — indeed, in retrospect Forte’s presentation of a set of analytical tools intended to reveal the structure of atonal music, which he apparently hears more as a unified repertoire (fl. 1908–1951), than as a collection of unique, unruly compositions, is perhaps the most audacious and provocative thing about SAM and his subsequent work. [5.6] Whether or not Forte’s discussion of sketch materials provides anything like a “smoking gun” that establishes an overt, conscious manipulation of octatonic cycles and subsets by Webern, they do help place Forte’s grand argument for an expanded octatonic approach to Webern in the context of the compositional details. The sketches, furthermore, certainly lead to unsettling conclusions about Webern’s sanity: given the composer’s own admission that Op. 6 is in some sense about his own reaction to the death of his mother, the prevalence of the A-ES or EsCHBEG ciphers, associated with Arnold Schoenberg, is bizarre; on the other hand, after a period during which the Schoenberg cipher appears in close conjunction with ciphers that stand for Christ (with whom, it seems, Webern’s beloved teacher was enharmonically equivalent), in the religiously-oriented Opp. 15 and 16 song sets Schoenberg’s pitch ciphers start to disappear and pitch formulas associated with more conventional religious figures such as Christ and the Virgin Mary begin to predominate. Forte’s presentation of these pitch ciphers is not unproblematic, however, since he seems to feel that the extra-musical associations of “the ubiquitous Schoenberg icon,” i.e. the pitch motto EsCHBEG, which belongs to set class 6-z44, inhere to all forms of its set class, as well as to forms of its complement, 6-z19. (13) This seems a questionable claim, in that it seems to require that we grant to Webern a working awareness of the concept of set class. Indeed, Forte’s discussion of musical ciphers, as well as his octatonic analyses, leads one to conclude that for Webern, as for Stravinsky, exact pitch location played a special role in his understanding of his own music — an issue that Forte raises, but does not fully explore, in this volume. [6.1] The analytical benefits of Forte’s octatonic reading are many; indeed, as one might expect from Forte, this is a cogent, rigorous, economical analysis. Whether the works in question comprise infallibly cogent, rigorous, and economical music is another story. Susan McClary has said that part of the impact of these pieces comes from the fact that this is music “. . . composed in deliberate opposition to the old system and without the security of a new one . . . that might genuinely be crazy,” and thus not susceptible to rational explanation. (14) And indeed, one might be excused for feeling that Forte’s unrelenting pursuit of a kind of unified field theory for Webern’s atonal music can lead one to overlook what is most vexing and valuable about this music. [6.3] Further objections are more technical. It is not clear, for instance, (the elegance of his octatonic analytical framework aside) that Forte has completely made a case for privileging those symmetric tetrachords which are octatonic subsets over those that are not. In other words, in Forte’s analyses, when an instance of 4-3, 4-9, 4-10 and 4-25 occurs at the surface of Webern’s music they are more or less what they seem, i.e. integral units which reflect the ultimate harmonic rationale of the music; when, on the other hand, the composer makes surface use of 4-1 or 4-7, which are often just as prevalent in Webern, he is conflating two or more subsets from two or more octatonic threads. [6.4] At the end of one’s involvement with this book, a question posed above asks itself again: if the “outer form” of an atonal composition by Webern is an unreliable guide to its essential structure, what considerations determine the “inner form?” It is worth noting that a Forte analysis, as ear- and mind-stretching as it invariably is, seldom constitutes a satisfactory analysis in and of itself; when it is time to summarize the movement and either provide a “big picture” (which would be the goal of a structuralist’s analysis) or conclusions about the processes that define how the piece lives and breathes (the highest aim of an organicist’s analysis), Forte either declines to do so or falls back on formulae, begging the question of formal coherence rather than answering it: “Webern seems to have ignored the time-honored principle of unity based upon the repetition of formal units . . . the music consists of a succession of short blocks that coalesce into larger sections.”(17) It is no surprise when Forte declares, near the end of his analysis of Op. 7 No. 2, that “Continuity, that elusive attribute in Webern’s atonal music, is provided instead, at the subsurface level by the interlocking octatonic threads.”(18) For Allen Forte is neither a structuralist nor an organicist, but rather someone for whom the audible world, above all, provides an opportunity to construct grand theories. The structure of the theory, not of the music, is the thing. [6.6] Forte: This music that you think you know so well is replete with property X. [A lengthy exposition of property X ensues.] Even when property X is not readily demonstrable, the deeper, more generalized property x is present in abundance. [6.7] Me: But I don’t hear it . . . hmmm. . . . wait a minute . . . OK, I sort of can . . . But what about properties Y and Z? [6.8] Forte: Y and Z are artifacts of the subtle application of X. Next question? [6.10] In the final analysis, there can be little doubt that this book will change the terms of debate on the atonal music of Webern. What it cannot do is give this repertoire a performing presence. Like Schoenberg, Webern occupies for the most part a special niche, that of a composer better known to scholars than to performers. On the other hand, even three more performances of Webern’s music by major orchestras or soloists in a single year would be statistically significant. More performances would help to assemble what analysts have needed for a long time; a base-line of performance practice against which to evaluate their analysis. How do our best performers hear this music? If Forte’s octatonic matrix provokes discussion and thought among even a few conductors and performers, who are, I suspect, largely ignorant of the extensive body of Webern analysis by theorists and for theorists, and who will have here a tidily presented and compelling way of understanding this music, perhaps Allen Forte’s most enduring legacy will be the most valuable of all—the entrance of Webern’s atonal works into some sort of performing (as opposed to analytical) canon. 1. Joseph N. Straus, Introduction to Post-Tonal Theory (Englewood Cliffs: Prentice-Hall, 1990); Remaking the Past: Musical Modernism and the Influence of the Tonal Tradition (Cambridge, MA: Harvard University Press, 1990). 2. Allen Forte, The American Popular Ballad of the Golden Era, 1924–1950 (Princeton: Princeton University Press, 1995). 3. Forte acknowledges his debt to Milton Babbitt, who introduced the concepts of pitch class, pitch-class set, normal form, etc. in his early analytical work, on the very first page of SAM. See Milton Babbitt, “Some Aspects of Twelve-Tone Composition,” The Score and I.M.A. Magazine No.12 (June 1955); “Twelve-Tone Invariants as Compositional Determinants,” Musical Quarterly 46, no. 2 (1960); “Set Structure as a Compositional Determinant,” Journal of Music Theory 5 no. 1 (1961). 4. Kathryn Bailey, The Twelve-Note Music of Anton Webern: Old Forms in a New Language (Cambridge: Cambridge University Press, 1991). 6. The worst thing is the lamentably large number of technical mistakes — miscaptioned examples and so on — that were allowed to slip by the editorial process. Forte’s ex. 4.2, for example, is apparently miscaptioned: it is an analysis of the beginning of the String Quartet of 1905, not of the Langsamer Satz. Forte 1999, 65; further errata available on request from the reviewer. 7. In the preface (page x, fn 3), Forte states that “As I began work on the present volume I destroyed all the filed analytical material I had accumulated on the various pieces I was about to investigate, just in order to get a fresh start, unencumbered by opinions and hypotheses that belong to an earlier era in my own studies,” thus proving that he himself is willing to approach this repertoire afresh. Forte 1999, page x, fn 3. 9. Unfortunately, Forte cites this as “Brinkmann 1987,” but there is no corresponding entry in his bibliography. I assume that this is a misattribution to Reinhold Brinkmann, “Ein Webern-Manuscript in Berlin,” in Ernst Herrtirch and Hans Schneider, eds., Festscrift Rudolf Elvers zum 60. Geburtstag (Tutzing: Hans Schneider, 1985). 10. Joseph N. Straus, “The Problem of Prolongation in Post-Tonal Music.” Journal of Music Theory 31.1 (Spring 1987), 1–21. 14. Susan McClary, Feminine Endings: Music, Gender and Sexuality (Minneapolis: University of Minnesota Press, 1991), 109. 15. Perhaps the most famous and well-reasoned critique of Forte’s procedures is found in William E. Benjamin, review of The Structure of Atonal Music. Perspectives of New Music Vol. 13 No. 1 (Fall-Winter 1974), 170–171. With respect to the present volume, Forte lists three “interesting analytical issues” which are, in essence, things that happen in Webern’s atonal music that he himself seems to feel his octatonic modus operandi does not adequately address: 1. “Short direct chromatic successions.” 2. “Dissonant monads” that don’t fit into the octatonic schema. 3. The “prismatic phenomenon” — i.e. multiple possible (octatonic) readings. Forte 1999, 315. 16. Forte 1999, page 89. 19. Roy Travis and Allen Forte, “Analysis Symposium: Webern Orchestral Pieces (1913), Movement I (‘Bewegt’).” Journal of Music Theory 18:6–43 (1974). Joseph N. Straus, Introduction to Post-Tonal Theory (Englewood Cliffs: Prentice-Hall, 1990); Remaking the Past: Musical Modernism and the Influence of the Tonal Tradition (Cambridge, MA: Harvard University Press, 1990). Allen Forte, The American Popular Ballad of the Golden Era, 1924–1950 (Princeton: Princeton University Press, 1995). Forte acknowledges his debt to Milton Babbitt, who introduced the concepts of pitch class, pitch-class set, normal form, etc. in his early analytical work, on the very first page of SAM. See Milton Babbitt, “Some Aspects of Twelve-Tone Composition,” The Score and I.M.A. Magazine No.12 (June 1955); “Twelve-Tone Invariants as Compositional Determinants,” Musical Quarterly 46, no. 2 (1960); “Set Structure as a Compositional Determinant,” Journal of Music Theory 5 no. 1 (1961). Kathryn Bailey, The Twelve-Note Music of Anton Webern: Old Forms in a New Language (Cambridge: Cambridge University Press, 1991). The worst thing is the lamentably large number of technical mistakes — miscaptioned examples and so on — that were allowed to slip by the editorial process. Forte’s ex. 4.2, for example, is apparently miscaptioned: it is an analysis of the beginning of the String Quartet of 1905, not of the Langsamer Satz. Forte 1999, 65; further errata available on request from the reviewer. In the preface (page x, fn 3), Forte states that “As I began work on the present volume I destroyed all the filed analytical material I had accumulated on the various pieces I was about to investigate, just in order to get a fresh start, unencumbered by opinions and hypotheses that belong to an earlier era in my own studies,” thus proving that he himself is willing to approach this repertoire afresh. Forte 1999, page x, fn 3. Unfortunately, Forte cites this as “Brinkmann 1987,” but there is no corresponding entry in his bibliography. I assume that this is a misattribution to Reinhold Brinkmann, “Ein Webern-Manuscript in Berlin,” in Ernst Herrtirch and Hans Schneider, eds., Festscrift Rudolf Elvers zum 60. Geburtstag (Tutzing: Hans Schneider, 1985). Joseph N. Straus, “The Problem of Prolongation in Post-Tonal Music.” Journal of Music Theory 31.1 (Spring 1987), 1–21. Susan McClary, Feminine Endings: Music, Gender and Sexuality (Minneapolis: University of Minnesota Press, 1991), 109. Perhaps the most famous and well-reasoned critique of Forte’s procedures is found in William E. Benjamin, review of The Structure of Atonal Music. Perspectives of New Music Vol. 13 No. 1 (Fall-Winter 1974), 170–171. With respect to the present volume, Forte lists three “interesting analytical issues” which are, in essence, things that happen in Webern’s atonal music that he himself seems to feel his octatonic modus operandi does not adequately address: 1. “Short direct chromatic successions.” 2. “Dissonant monads” that don’t fit into the octatonic schema. 3. The “prismatic phenomenon” — i.e. multiple possible (octatonic) readings. Forte 1999, 315. Roy Travis and Allen Forte, “Analysis Symposium: Webern Orchestral Pieces (1913), Movement I (‘Bewegt’).” Journal of Music Theory 18:6–43 (1974).